Felicity “Flea” Perry and Claire Taylor give us their outlook on the Women’s division. The top of the UK women’s tour is currently a tale of one team – the London based Iceni decimated the field at Tour 1. They won every game with acres to spare. With only 14 points scored against them over six games, they are a well drilled and highly skilled team of athletes. Their performance was impressive to say the least, and their resolute attitude to be the best saw them sail through the opposition at Tour 1. We could talk about the gusty conditions, but we would just be rehashing old news. It’s Nottingham, it was windy, people played zone, let’s move on. The pitches were in great condition, the tournament was well organised, and the sun even appeared briefly. World class performances are the ticket for the teams wanting to take home the crown at this weekend’s first Tour playing out in Nottingham. The Cambridge and Oxford combination team Punt currently reign supreme over the 27 teams entered into this weekend’s tournament after they finished ahead of SYC and ROBOT at the conclusion of last year’s Tour. This season led by the dream-team of Jassy Drakulic, Trish Emeny and Lola Denham – will have to answer to the skills and tactics of world class teams such as SYC, GB Women’s Masters, GB U23, and the Spanish Women’s Masters in order to keep their throne. At this event last year Punt were able to hold off Iceni in the final for a while but eventually caved into the National champions, but can they take a victory off the London warriors in Nottingham? With much talk of closing the gap centring on the need for stronger skills as a nation of players, it is hard to argue against this positive aspect of playing at a ‘harder’ venue, even if (as Si also pointed out) the forecast is set for uncharacteristically calm scenes this weekend (…fingers crossed eh?!). With the filtering out of international competition, this weekend will act as the season’s first true comparison between domestic teams, many of whom did not meet in London. The Clapham machine sees benefit in continuing its split team entrance, and will be looking to repeat their lossless weekend up until the final. EMO find themselves in their highest ever seeding after a strong start to the year as predicted. Whether or not this team can justify their placement above Chevron who comfortably bettered them at major tour events last year is yet to be seen. In a straight to semis format, old friends Chevron and Fire 1 will both be battling for an upset victory against Clapham O, or failing this a place in the knockout stages which could well be decided by their 15:40 meeting on Saturday. Can anyone stall Clapham on their road to Lecco? Photo courtesy of Andrew Moss. Acclimatisation for this year’s major tournament is clearly a focus, but it would be wrong to suggest that the top brackets are the only ones to provide a source of excitement. The second eight of the A tour has arguably flattened out somewhat, with almost all teams having recently enjoyed top 8 seedings in their recent history. The battle from teams such as Ka-Pow! and Devon to rejoin the top pools (and the all-too-valuable elite competition such seedings provide) will be hard pushed by newer outfits such as Glasgow, who at ninth will be poised to restore the recent lack of a Scottish presence in the top flight of UK ultimate. The 16-32 B tour bracket continues to heat up as it is increasingly compressed between the top 16 and the ever-growing C tour (now at 28 teams). After emphatically topping the C tour in St. Albans, Curve (with a boost from ex GB open players Niall Wilkinson and Rob Anderson) have been awarded a high seed and will be hungry to make a mark in their first game match-up against Fire 2, who consistently competed in the A tour last year (famously leap-frogging their first team at last year’s event). Perennial club teams will also have to overcome the GB and Irish Under 20 Open squads, who are attending tour in preparation of their world championships, also to be played in Lecco this summer. These young teams will make up for any lack of experience with buckets of athleticism, and will gladly welcome still conditions to show off their runners. With the lure of international silverware these teams will be playing with nothing to lose at this stage, and could cause upsets for any team in the bracket. Our C Tour report comes from Christopher Bell (Black Sheep Co-Captain/coach). With the seedings having hopefully sorted themselves out somewhat, and the inclusion of some strong teams replacing those promoted, C tour is lining up to be an exciting affair this weekend. With two power pools at the top, it’s going to be difficult for any team 9th and below to break into the top 8, and even harder to make any further headway. There are, however, some teams that will be trying to do just that. Black Sheep may see this tournament as an opportunity to atone for last year’s failure to beat seed at Nottingham, where they started 9th but were unable to top their group due to the inclusion of the under-seeded Irish u20s. Expect Lemmings and a strengthened Camden side to mount serious challenges too. Keep an eye too on the GB u17s, they will come into this tournament with nothing to lose and a lot to prove. Always an athletic team, well drilled and with a great mentality – expect them to fight for every point as they aim to climb their way up the seedings. The game to watch on Saturday is most definitely the battle of the North East: The Brown (1) v The Saints (3). The Brown have a point to prove after being relegated from B Tour last time round, and The Saints, victors in Nottingham this time last year but absent from London’s Calling, will want to prove that they can do it again. Expect a high intensity game, with both teams working very hard to shut down their opposition, whom they know well. Each of Sunday’s games in the top 8 are going to be gruelling affairs, with close match-ups across the board. It’s tough to call how it’s going to pan out, but here’s my prediction for the semi-final teams: The Saints, Pingu Jam, ABH and Guildford. 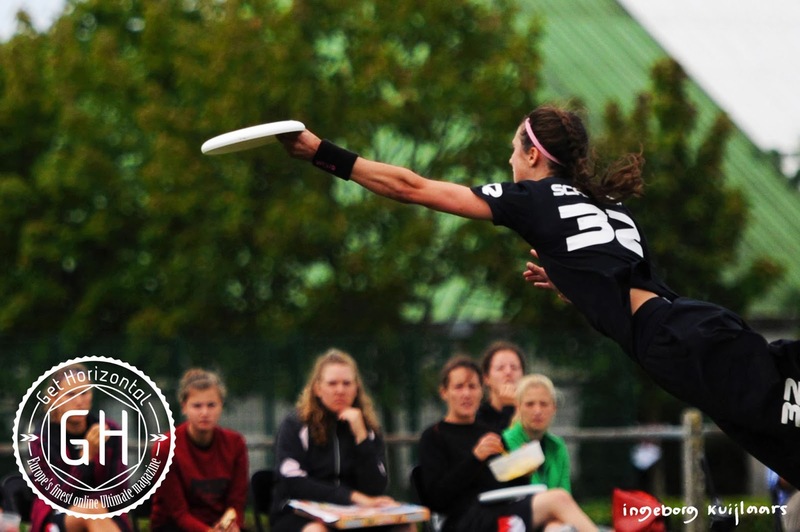 “Even though Iceni finished London Calling as top dogs, we took away a couple of key things we needed to improve and adjust to come back stronger for the rest of the season. After T1, we knew we had to find discipline in our endzone, set a harder mark, and ramp up our sideline. Basics. After focusing on these elements of our game, we took our adjustments to a very sunny Windmill Windup in Amsterdam last weekend (Happy 10th birthday Herbie!). Punt have a chance at making the final, who else could make it in Nottingham? Photo courtesy of Andrew Moss. “This season, Relentless aimed to grow and develop into a team that can compete in the top eight after an up and down debut season last year. London’s Calling was the first test of all of the work the squad put in as a whole over the off-season. It seems many can’t see anything other than a clean sweep at the top for the London powerhouses in both divisions, but there will be plenty of players travelling this weekend with their eyes on the prize of a giant killing across the team list. The high winds and rain generally favour upsets, but with the dry and calm forecast it is looking as though anyone matching up against a favourite this weekend is going to have no choice but to beat them one-on-one, at full speed. Good luck to all teams competing this weekend from tSG! London Calling yet again upheld its welcome tradition of providing impeccable weather to kick off the season. On the still and sunny pitches of St Albans, it also didn’t fail to deliver significant shake-ups, with only four teams holding their original seeds. Nevertheless, there unfortunately remains an apparent divide between the teams in the top and lower halves of the table. In fact, one of the few who held seeding included returning Tour champions Iceni – unmoved from the summit of the standings – as well as Swift, who continued to lead the pack in the lower half. E6 and Iceni both had more or less straight-forward routes to the final. Other than a close opener between E6 and Bristol Cupboom (won 15-12 by E6), neither finalist conceded more than 7 points until their meeting on Sunday. 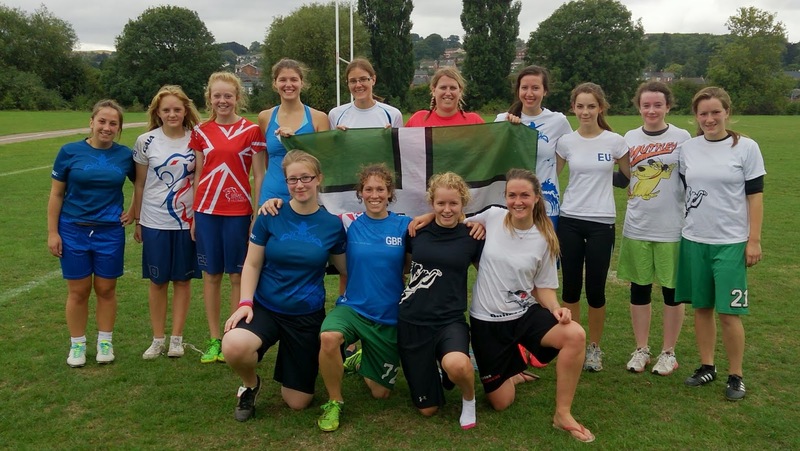 Thankfully, the final was not such a walkover for either side as the Swedes’ impressive athleticism was a worthy match for Iceni. The temperate conditions really played into the hands of E6, who had successfully been connecting well placed long shots and high grabs all weekend. In addition to the Swedes’ monopolisation of the break side, the Londoners also at first struggled to halt their opponents’ fast flowing play. However, Iceni’s large squad was eventually able to capitalise on tiredness, and after stepping up the one-on-one D saw out the game with a confident offence. It is disappointing however, that neither Bristol team demonstrated much of a threat to either finalist in the semis, as would surelyhave been expected after E6 only just edged victory in their opening game to Cupboom. Cupbowl, however gave them no such challenge. Granted they had themselves had only just won a tight game to SYC but it seems the depleted size of both Bristol teams left both of them without the energy to push as hard as was needed. This was later confirmed by the decision to forfeit the subsequent 3v4 match between the two sides. The schedule at Worlds will be demanding just as much consistency from them, if not more, and perhaps this was a wasted opportunity to push themselves as hard as they will need to in order to reach their full potential in Italy. The lure to enjoy the afternoon sunshine instead of showing some final game grit surely doesn’t strike fear into the hearts of their future opponents. Elsewhere the last games of the day proved to be a much more competitive affair with close games between Free Agents and Punt, and SYC and YAKA. Free Agents made the greatest ascension of the tournament to take fifth spot, and their last game could have been an even closer affair if Punt had not allowed the score line to run away from them so much at the beginning. It was only once they ironed out the kinks in their own offence and stopped making unforced errors that they were able to start catching up, but unfortunately for them it wasn’t quite enough. That said, Punt had another great tournament and continue to carry through the success of last season, leapfrogging both SYC and LLLeeds, who both began the tournament seeded above them. Certainly, they will have to keep the foot on the pedal at Tour 2, as SYC will surely have them in their sights. Having won a sudden death victory over the Cambridge outfit on the Saturday morning crossover, they’ll know they are capable of a better finish next time round. In fact, I think SYC deserve some credit for in despite of their losses, their close score lines reflect constant battle all weekend. Their victory in their final game to YAKA will have been a well earned reward and a testament to this grit. Unfortunately for the French, it’s safe to say that they were (as predicted) slightly overseeded for this tournament with the loss of key play-makers. In contrast to the top 8, it was a great shame to see such a dearth of contest in the final games of the day amongst those fighting for the lower ranks. The only competitive result was to determine who finished 11th, between Swift and Brighton Pretty. Whilst it was still a very positive finish for the southerners, it was the Scottish who emerged victorious (15-10) to end the competition where they had begun. In the rest of the fixtures there was a surprising gap between the winners and losers; considering that by this stage of the tournament you should be playing your most well matched opponents. Admittedly, I cannot confirm the reason behind the forfeit of the match between Relentless and Crown Jewels, but I hope (in the nicest way possible!) that it was enforced rather than mere lacklustre. Earlier in the weekend, Relentless were unfortunate to lose in sudden death to Blink, who ended up only finishing one seed above them. The matchup between them and Crown Jewels therefore surely promised to be a good game. Equally, the lack of fight is apparent in the remaining score lines, in which none of the defeated teams managed to rack up more than eight points. Yet new outfits Devon and Manchester (who finished five places apart from each other) had played a tighter result in a preceding match against one another which finished 10-13. This suggests to me that these final game score lines are not a result of disparaging ability but simply a lack of fight and love to play your best Ultimate whenever you get the chance to. I can’t help but feel with a little more focus and discipline, the belief and confidence to become ever more successful will be a natural by-product. To demand high expectations of yourself and your team even in that last, seemingly inconsequential 23v24 game, should not be sapping the fun out of the experience, but another opportunity to do something great. Another opportunity to create another great memory with your team mates, and achieve things you perhaps never imagined you could, no matter if you’re victorious or not. You’ll never know, if you don’t try! Naturally, looking ahead to Tour, the majority of the teams going to Nottingham will have their seedings bumped up by the departure of our international guests and the pick-up teams who can’t field enough players. Still, let’s hope that the results show a much more linear gradation in the standard of teams rather than such a stark divide between the upper and lower half of women’s Tour. The season has only just began and hopefully everyone now has a taste for battle! Especially for our two teams heading to worlds, they are out of the training ground, and are now well on their way to Italy. From here on out, it should be expected that the fight will only get harder and harder…. Relish it! The season’s off with a cracker of a tournament and can only get better. Stay tuned for more recaps as well as Tour 2 previews!